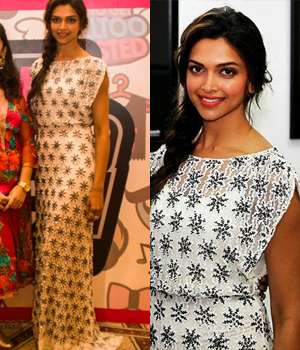 You can view Bollywood Anarkali Dresses Party Wear by Indian Deepika now as Deepika Padukone showcased the dress on runway designed by developer Manish Malhotra. During this runway show, the actress displayed the collection of night time glowing blue lehanga choli in the same manner designed by Manish Malhotra. The choli was simply made of velvet color reaching the belly button. It was without decoration and includes full bells sleeves. But the lehanga was of course very astonishing. Zardogi is used for embroidery of the lehanga which was covering from waist line to the ankle.